In the late 1920s the Trennert foundry in Hamburg-Altona, Germany, commissioned several fonts from freelancer Heinz König. His chunky, striking Alarm typeface and its blackletter-style companion, Wiking, are among the most remarkable display faces from that period, and were briefly quite successful across Germany. The 1928 Alarm was probably designed to compete with Berthold's successful Fanfare from the previous year, drawn by Louis Oppenheim, but different in every detail. 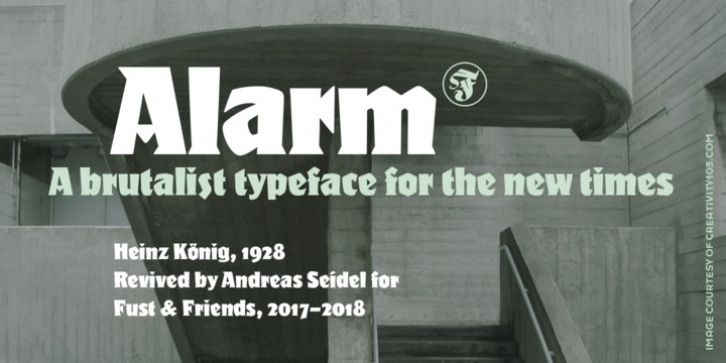 Alarm has never known a serious digital version, until Fust & Friends decided to have a go, after collecting vintage specimens of the face, and doing some test printings with an authentic 72pt-size metal version. Our friend Andreas Seidel (principal of astype) did an exemplary job, homogenizing the character set without abandoning its quirkiness, expanding the character set with the usual contemporary symbols as well as diacritics for most languages that use the Latin alphabet, and adding mediaeval and tabular figures. An advertising classic is ready for a new life.